The storm damaged aircraft and buildings at the airport in Plentywood. 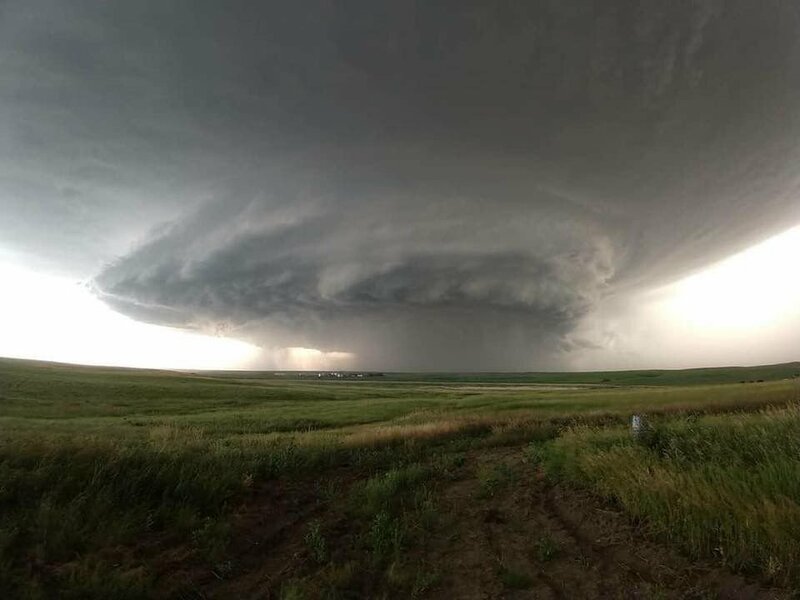 Monday's storm over Plentywood in Sheridan County shows a classic shape. The towns of Plentywood and Outlook, along with other portions of Sheridan County in Montana's northeast corner, remained without power late Tuesday morning after a severe thunderstorm bore down on the area Monday evening, destroying buildings, knocking down trees and causing extensive damage to the county airport. No injuries had been reported as a result of the powerful storm as of 11 a.m., Sheridan County Disaster and Emergency Services Coordinator Andy Olson said. Several buildings and airplanes were damaged at the airport, and downed trees had taken out power poles throughout Plentywood, he added. "A lot of the aircraft that were in those buildings are severely damaged, if not a total loss," Olson said. The Civic Center in Plentywood had power and air conditioning, according to the Sheridan County Sheriff's office. During the storm Monday evening, a Sheridan County family took shelter under a pickup in their shop while a severe windstorm destroyed their nearby trailer house. Chase Anderson, his wife and their two children were in the shop Monday evening when the wind started shaking the building, Sheriff Heidi Williamson told the Associated Press. Williamson said they stayed under the pickup until the storm passed and walked out to find a bare spot where their trailer house used to be. The shop also was damaged. The National Weather Service estimated that wind speeds were up to 127 mph on the eastern side of Plentywood, Williamson said. A microburst at the airport destroyed at least nine small airplanes and bent over the radio tower, she said. Photographer Taylor Ordahl documented damage at the airport and around town and said she saw ping pong ball-sized hail. Much of Montana, including Billings, was under a severe storm watch Tuesday, covering a swath of land from Havre to Plentywood and Bozeman to Forsyth. Hail up to 2 inches in diameter and wind gusts up to 70 mph were possible. The Bismarck Tribune reported a 1-week-old baby died and several dozen more people were injured after Monday's weather system crossed into Watford City, North Dakota. Residents of an RV park said there was little warning before the tornado ripped through the neighborhood. The weather service confirmed that a tornado hit the area, but the weather service initially also investigated the possibility damage was from straight-line winds. "One thing we like to tell people is that a severe thunderstorm can generate winds up to 120 miles per hour and can do just as much damage, if not more, than a small tornado can," said Ted Jamba, a meteorologist with the National Weather Service office in Glasgow. A succession of super cells, highly active thunderstorm systems sometimes associated with tornadoes, moved through the Plentywood area around 8 p.m. Monday, Jamba said. Initial data from the event were spotty, and weather stations can get disrupted or damaged by high winds, but Jamba said his office had at least one confirmed report of an 86 mph wind gust recorded in Dagmar, southeast of Plentywood, just before 8 p.m. Photos of the devastation circulated on social media Tuesday morning, showing high-tension power line poles knocked to the ground and airplanes battered to pieces at the airport. Let us know what the weather's like where you are. Sign up for breaking news emails for the latest on weather events. A small lightning-caused fire is burning in Yellowstone National Park and is visible from the Grand Loop Road between Canyon Village and Mud Volcano.